Sprint Cup: Ryan Blaney Grabs Strong Top 5 – Ryan Blaney led the charge for Sprint Cup Series rookies with a top-5 finish in Saturday’s Go Bowling 400 at Kansas Speedway. 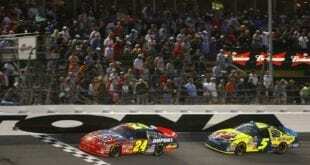 It was a feel-good story in an otherwise fall-asleep Saturday night at the 1.5-mile oval. Blaney’s fifth also made the record books. 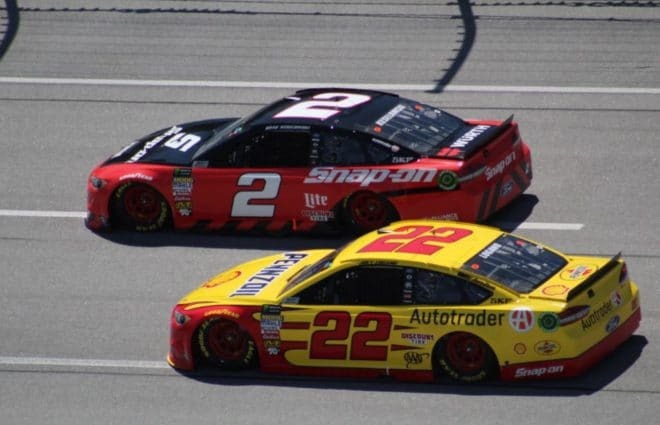 Wood Brothers Racing scored its first non-plate oval top-5 result since Ricky Rudd finished fourth at Bristol Motor Speedway in 2005. Qualifying seventh in the No. 21 Ford, Blaney was a constant threat among the top 10 throughout the 267-lap event before reaching the top 5 prior to the halfway point. Smooth, calm and collected as always, the night looked clean for Blaney with 27 laps remaining until Denny Hamlin, Brad Keselowski and Joey Logano crashed in turn 3. Shortly following a restart, Blaney steered clear of the melee before making ground on the race’s final restart, climbing to a fifth-place result at the line. The result proved to be a nice boost for Blaney, whose father Dave was released from hospital care following a sprint car crash at Eldora Speedway on Friday. XFINITY Series: Is Dover’s trend of sweeps over for good? – In recent years Dover International Speedway had not been kind to XFINITY Series regulars. From 2010-2014, Sprint Cup drivers dominated at Dover with one sweeping the XFINITY races each year. 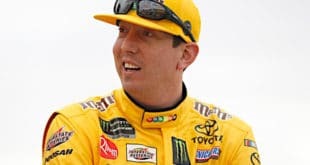 The trend started with Kyle Busch in 2010 while Carl Edwards repeated the feat in 2011. 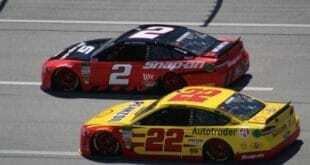 Joey Logano then won the next four Dover races, driving for Joe Gibbs Racing in 2012 and then with Team Penske in 2013. Busch conquered the Monster Mile twice in 2014, marking the fifth straight year he earned a Dover sweep. However, the streak of 1-2 punches got snapped last year. 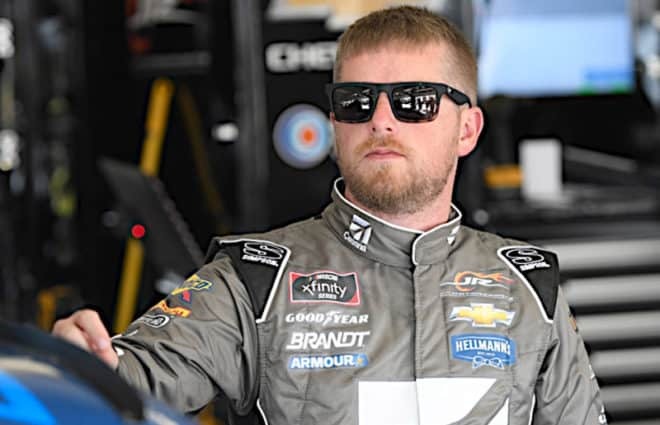 In the spring race, Chris Buescher prevailed thanks to great fuel mileage and after some rough racing with teammate Darrell Wallace, Jr. 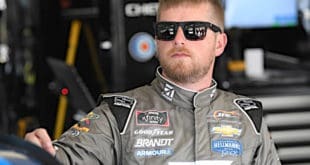 When the series returned to Dover in the fall Regan Smith held off a late charge from Busch and Denny Hamlin to claim his final victory with JR Motorsports. Camping World Truck Series: Parker Kligerman, Jordan Anderson in Danger of Missing Charlotte – While the Truck Series does have its share of multi-truck teams – Kyle Busch Motorsports, ThorSport Racing and GMS Racing come to mind – it’s the smaller, single-truck efforts that are working hard week-in and week-out, scraping together every possible dollar to keep themselves on track. When an on-track incident happens it’s a huge blow to an organization that’s already hanging on by a thread. This past week, the lightning bolt struck Ricky Benton Racing Enterprises. After finishes of third, eighth and eighth to open the season, Parker Kligerman had high hopes for his run at Kansas. Despite not showing much speed during the practice sessions, the team focused on handling for its No. 92 Ford, a move that served it well when most other teams struggled in the early stages of the race. There was only problem with Kligerman’s promising performance: he didn’t get to finish it. A mid-race wreck while climbing through the field left the veteran angered by the level of aggressiveness displayed on track; it also left him with a bunch of mangled sheet metal in place of a truck he needed to stay in one piece in order to keep competing full-time in the series. Jordan Anderson and his Bolen Motorsports team are in a similar situation to Kligerman’s. 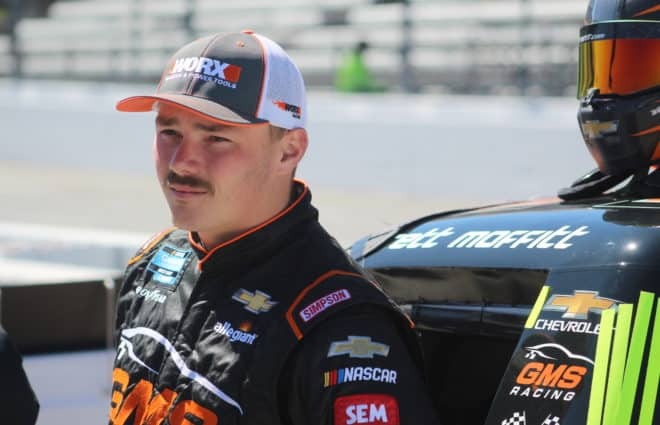 While the team has a few more people at the shop than RBR does, the hits are just as hard for the Bolen organization, a new team that failed to qualify for Atlanta and Martinsville. A multitude of wrecks during the race allowed Anderson and the No. 66 truck to climb into the top 10 and race with the leaders until contact sent him hard into the wall. The damage to the truck turned out to be more than could be repaired as he returned to the garage just a handful of laps later after a second hit, which was even harder. Formula 1: Verstappen Rises to Red Bull – In a bit of a bizarre move, Max Verstappen and Daniil Kvyat are swapping seats beginning at the next race in Barcelona, Spain. Kvyat, who had been driving for Red Bull, had endured scrutiny for back-to-back race incidents that involved Sebastian Vettel of Ferrari. That being noted, the change still comes at a surprising time, just four races in and with a series where in-season changes are rare. The real issue is not that Kvayt had proved to be reckless, but rather that he was failing to keep up with his teammate Daniel Ricciardo, who had been out-qualifying Kvyat and showing consistently better lap times. Ricciardo currently sits fourth in the standings, 64 points behind Nico Rosberg of Mercedes for the championship, while Kyvat sits eighth. Verstappen, in contrast, continues to show that he is a driver on the rise. While driving for the team’s sister organization, Toro Rosso, he has shown himself quite able and made it difficult for Red Bull to keep him in a less well-funded seat. Bringing Verstappen to Red Bull also came as a way to keep him in the fold as the F1 silly season begins to round into form. IndyCar: Max Chilton Gets Dirty at Eldora Speedway – What’s a Verizon IndyCar Series rookie and former Formula One driver to do on the Friday night of an off weekend? In Max Chilton’s case, the answer was simple: head to a dirt track. 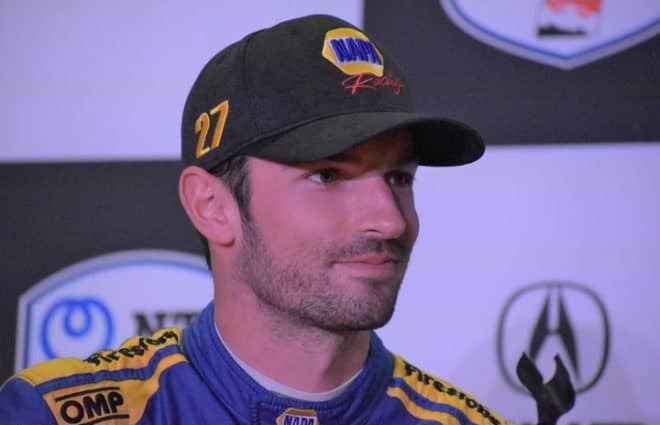 Chilton, a rookie for Chip Ganassi Racing this season, made his way to Tony Stewart’s Eldora Speedway Friday night to partake in night one of the Rossburg, Ohio, track’s #Let’sRaceTwo weekend of World of Outlaws Craftsman Sprint Car Series and USAC Sprint Car Series racing. Chilton enjoyed being on the other side of the fence while taking a mental “off night” before the rugged schedule of the next few weeks. Sports Cars: Low Fuel Prices = A Top GT Team Stepping Away? – Normally, you’d think that lower prices at the gas pump would allow teams to go to more races since it would lower expenses. Well, EFFORT Racing, one of the top teams in Pirelli World Challenge’s GT-class, is not every team. Much of its financial backing comes from the oil industry. With prices per barrel currently averaging around $45 for reasons that seem to revolve around Saudi Arabia trying to pump out oil at a rate that would cripple the newly revitalized oil industry here in the United States, it is hard to make money right now. As a result, EFFORT Racing’s funding is starting to dry up. On Friday, the team claimed the dip in funding as reasoning for withdrawing its two Porsche 911 GT3-Rs from the next round at Canadian Tire Motorsport Park and taking a break from Pirelli World Challenge competition. At the present time, EFFORT Racing’s two drivers, Patrick Long and Michael Lewis, have combined for three victories this season. Lewis is fourth in points after winning both rounds in St. Petersburg, while Long is fifth after winning Round 1 at Circuit of the Americas, then getting wrecked at the start of Round 2. I know the FS staff and fans believe Ryan Blaney is some kind of massive underdog in spite of his association with the Penske monolith, but let’s keep things in perspective. Blaney seemed to have a great car all night. Chase Elliott looked like he was riding a 3-legged dog. Yet, at night’s end, Blaney was 5th and Elliott 9th. When you finish 9th with a crap car, that is how you build a championship season. Keep it up Chase, the cream rises, even with a bad batch of milk. Hey Broken Record, your all-consuming hatred for Blaney and The Wood Brothers is getting really tiresome. We all get it! You hate this kid’s guts, and you hate the Wood Brothers. You feel he’s a threat to Chase Elliott getting the Rookie of the Year. You need to get off your high horse and cool it. the kid drove his guts out on Saturday night. You also need to get back on your meds!